Rare, Belgian Gold Franc Gold Coins are very much in demand and are of equal appeal to investors and collectors. Belgium only began minting its own currency in 1829 following independence from The Netherlands. The earliest Gold Francs bear the portrait of King Leopold I of Belgium and were issued between 1831 and 1865. Leopold II Gold Belgian Francs were minted throughout his reign from 1869 until his death in 1909. However, during the 25-year reign of his successor, Albert I, Gold Francs were only issued once in 1914. Of the 250,000 minted, 125,000 coins carried a Flemish inscription and 125,000 a French inscription. Belgian Franc Gold Coins contain 900/1000 fine gold and, like all gold investment coins, they're VAT Free at coininvest.com. Belgian Franc Gold Coins are a piece of Belgian history as well as a valuable asset. They are a popular investment for collectors as they exist in limited quantites. Belgian gold coins are available to purchase from the CoinInvest website from time to time, but because of their rarity, we cannot always guarantee coins will be in stock. If you are fortunate enough to catch us on a day when we have any Belgian gold coins for sale, we recommend you take the opportunity and act fast. To purchase simply click on the image of the coin above to go through to the product purchase page. From there, add the product to the basket where highlighted and either proceed to check-out or continue browsing our online store. Belgium first began minting their own coins in 1832 following independence from the Kingdom of the Netherlands. Because the money in circulation prior to that was from ruling countries, there was not many Belgium francs in circulation. The 20 franc and 40 franc gold coins therefore were instantly a highly valuable asset. The holder of gold coins in those days knew that the face value of the gold coins were worth the same in national currency and could exchange a 20 franc gold coin for twenty francs. Such is the importance of gold to today’s economy, the precious metal is only used as an investment tool that cost far more than their face value. Belgian gold francs certainly fetch more than their face value, especially given they are highly sought after collector’s items that are in short supply. Some of the earliest coins still in existence today bear the portrait of King Leopold II who was the King of Belgium from 1869 until his death in 1909. His successor Albert I did not share the same enthusiasm for gold coins and during his 25 year reign only produced gold coins on one occasion – 1914. For this reason, these coins are particularly in high demand. Indeed only 250,000 Albert I gold coins were ever minted, and even then two sets were produced, 125,000 coins with a Flemish inscription and 125,000 with a French inscription. Leopold II gold coins were issued for each year of his reign and featured his profile facing to the right. His name, date and the words ROI DES BELGES (King of Belgium) are inscribed around the edge. Underneath the bust are the initials L.W. representing the engraver L. Weiner. On the reverse we find the Coat of Arms of Belgium, a mythical lion encased in a shield and topped with a crown. The face value of the coin is inscribed below the crest and the words L'UNION FAIT LA FORCE which translates to English as Unity is Strength. The Albert I coins are not much different in terms of design considering the King’s profile is on the obverse and the coat of arms on the reverse, although the crest is pictured bolder and with finesse in its artistry. Albert is also depicted in military uniform. 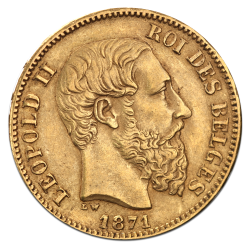 Belgian gold coins have not been produced since 1914, and were most prevalent under the reign of Leopold II from 1865 to 1909. Belgium sourced their gold from African mines, more specifically the Congo where there was a high concentration of fine gold in the 19th Century. Gold Belgian francs were made to a relatively high standard of mint although their experience was several hundred years behind rival European mints, dedicated resources and funding to match their counterparts. CoinInvest is always on the look-out for valuable gold bullion coins – especially coins that are as rare and valuable as Belgian gold francs. If you do have any Belgian coins for sale and are looking to sell your asset for a competitive price, contact a member of our staff with the details and we will be happy to prepare a fixed-fee offer on your behalf.